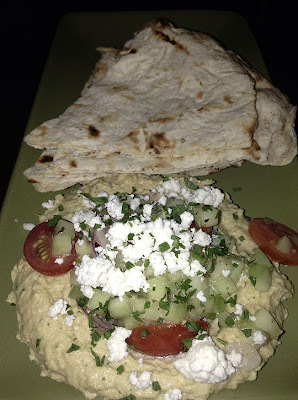 I love a good Hummus and what makes this one extra special is the addition of a lightly dressed Greek salad. I first had this combination at Olive & Ivy in Scottsdale and soon found out it is a signature dish from the True Food cookbook by Andrew Weil. The book contains over 100 beautifully photographed recipes that are found on the menu at True Foods restaurant along with lots of interesting tid bits about food and diet. I love making this and packaging it up for my lunches. I'll eat this with some fresh pita or even just pita chips. It's portable and lasts for a few days in the fridge; and it's what's in my Brown Bag this week. Place all ingredients but the olive oil in a food processor and blend until it is a smooth paste. Add the oil slowly in a stream and blend until well combined. Transfer to a bowl and store in the fridge until ready to eat. Combine all ingredients but oil and yogurt in a food processor and mix until combined. Slowly drizzle in the oil and blend until the mixture is emulsified and thick. Transfer to a bowl and whisk in the yogurt. Store in the fridge until ready to use. To serve: Put 2 cups of Hummus on a plate. Mix the salad with 1/4 cup of the Yogurt Dressing. Top the Hummus with the mixture and sprinkle with the feta cheese and fresh herbs.